Traveling to Portugal’s main tourist spots in the main tourist season in summer is a great idea for masochistic people. Whoever likes queues in desert like temperatures or looks for body contact with sweating international tourists will have a lot of fun backpacking Portugal in summer. Try to go in spring or autumn instead! But in general, backpacking Portugal on a budget can be a fantastic experience. The Portuguese people are super friendly. Portugal is home to the famous Boom Festival every two years. Moreover, the landscape is stunning and the food in local pastelarias away from the main tourist spots very affordable. For around 5 to 7 Euros, you can get a Portuguese meal, for around 3 Euros a kebab or falafel. The public transport in Portugal is mostly cheap and reliable. I always traveled around Portugal by bus. I felt very safe and comfortable backpacking Portugal as a female single traveler, when I stayed in backpacker hostels and did couchsurfing. Hostels start from 7 Euros for a bed in spring and autumn. But it’s also a fun destinations for couples as you can still find very affordable rooms. 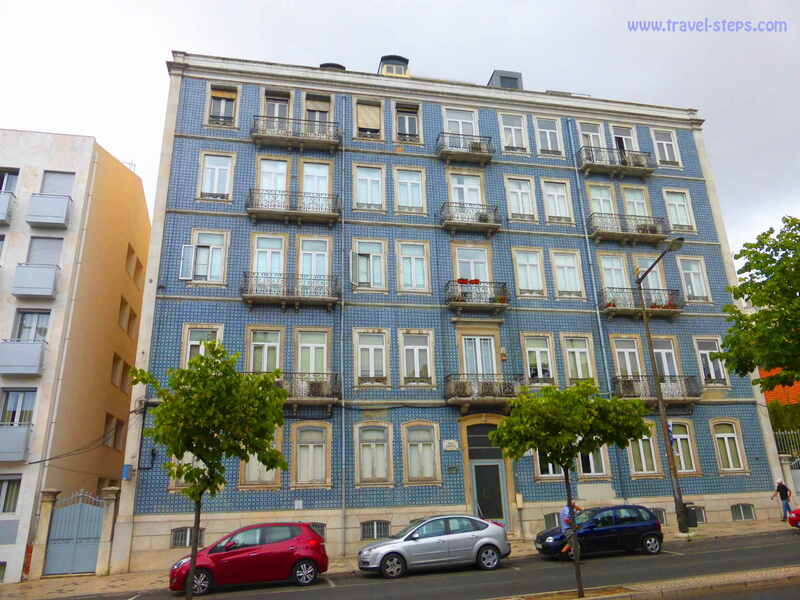 A very basic double room in Lisbon can be available for 25 Euros per night. We even found good deals in summer while backpacking Portugal in 2016. 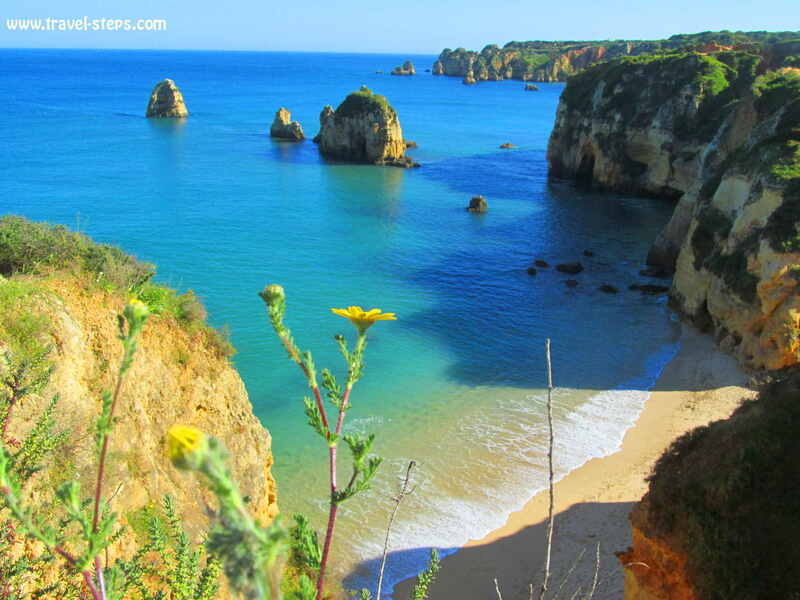 We found cheap hotels, fast buses and some great spots in Lisbon, Porto and the Algarve coast. I have traveled to Portugal twice. One time in spring 2013 as a single female traveler, the second time in summer 2016 with my partner. The first time backpacking Portugal in spring, I enjoyed strolling trough empty lanes of Lagos at the Algarve coast, did long undisturbed walks by myself around the rock formations, discovered Sintra’s old town and had spontaneously a fantastic ride in Lisbon’s tram line 28 around the famous Alfama. I was even able to find everywhere accommodation spontaneously. The second time backpacking Portugal on a budget in summer 2016, we hardly managed to find an affordable room in Lisbon at all. 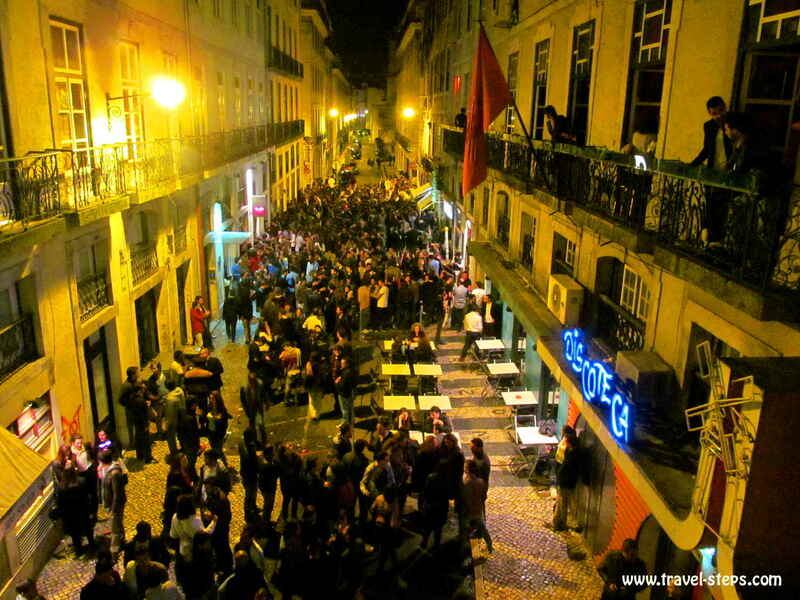 Together with my partner, I arrived spontaneously in Lisbon after the Boom Festival. We just had four days in Portugal. We walked with our backpacks for hours around the city center to end up in a pension, which you would not choose for your honeymoon. I almost used my elbows to make my way through Sintra’s old town. The queues for the popular tram line 28 at the square Martim Moniz in Lisbon were more than 100 meters long in summer. And it was tough to find a spot at the beach of Cascais without touching our neighbors’ toes. Already at the airport, there had been long queues at the metro ticket machines to get to the city center. And going to the suburban beaches of Lisbon at the weekend meant waiting for hours in front of the ticket machines at Cais do Sodré or finding alternative ways to get into the train. One of the last cheap rooms available spontaneously in Lisbon while backpacking Portugal in summer 2016 was in “Josefina Guesthouse”, Av. Almirante Reis, 61. The multi cultural area around the metro station Intendente is worth a visit, if you are looking for budget accommodation. We saw more people walking around with backpacks. We knew, that we had to hurry to find probably one of the last free rooms in Lisbon. “Josefina Guesthouse” looked a bit rough at first sight, didn’t offer wi-fi or any other luxury. But the last room available was just 25 Euros per night for two people in the main tourist season. 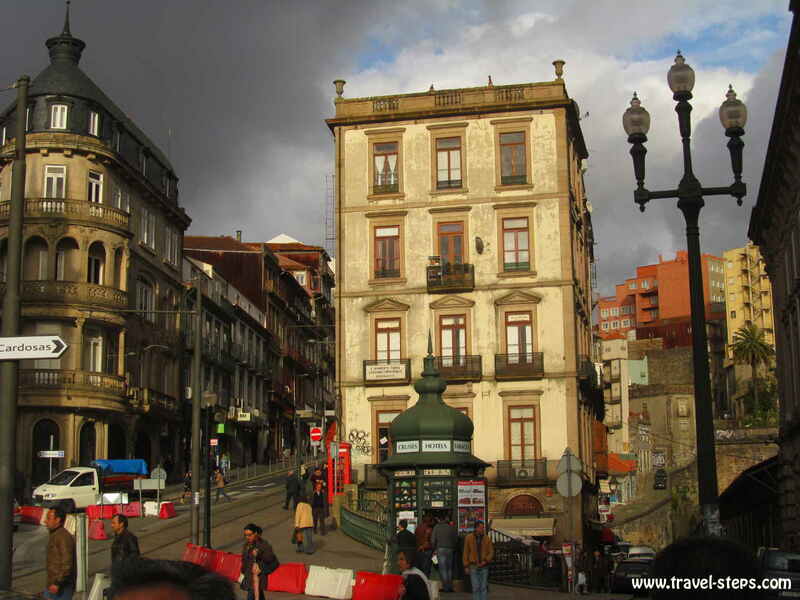 “Josefina Guesthouse” is still in walking distance to the city center. In our room, there were two twin beds on a beautiful old wooden floor, a half-broken lamp on the bed table and the crazily loud sound of the TV coming from another room across the dark courtyard. No luxury. We felt exactly what we were doing: Backpacking Portugal on a budget. But the staff of the “Josefina Guesthouse”, was very cool. It was one of the places, where you are probably able to hide away for months and pay the room rate day by day every morning. The guesthouse was proud to have kept the lowest prices in town for years already. There were a lot of international guests and backpackers around. A lot of guest were clearly backpacking Portugal on a budget. To a certain extend, I enjoyed being at “Josefina Guesthouse” while backpacking Portugal. We just saved so much money. The whole place was in a very interesting neighborhood with tattooed policemen around and some life taking place in the street. And the city center of Lisbon was just in walking distance. Lisbon itself was inviting us for a long walk. It is about glamour next to run down houses. It is about eating great fish. It is about enjoying life by night and by day. Seeing the ocean, the old town Alfama, walking around to some viewpoints. 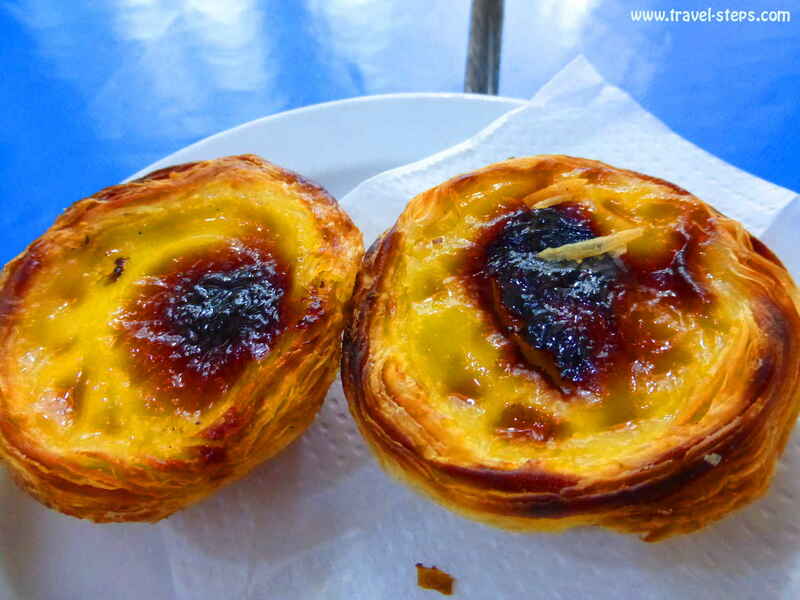 Discover the trams, the churches, Fanta with Maracuya flavor, Fado performances in many bars and restaurants and try the famous cake Pastel de Nata. It is about the views into the courtyards. It is about the beautiful tiles, that cover the facades of old houses. Places like Belém attract a lot of tourists with the Torre de Belém or the Monument Das Padrão dos Descobrimento. That all makes Lisbon a great place to hang out for a few days. These were the things, that we really enjoyed while backpacking Portugal. Interesting to know about Portugal: Since 2001, possession of personal quantities of all drugs, including cannabis is a non-criminal offence. Treatment instead of punitive penalties is the idea behind it. Maybe that is why some guys try to make a business of selling fake hashish to travelers in the city center. But drugs in general are still illegal in Portugal. Drug dealers and traffickers are still sent to jail. And policemen will still take away the drugs from anyone, who gets caught. 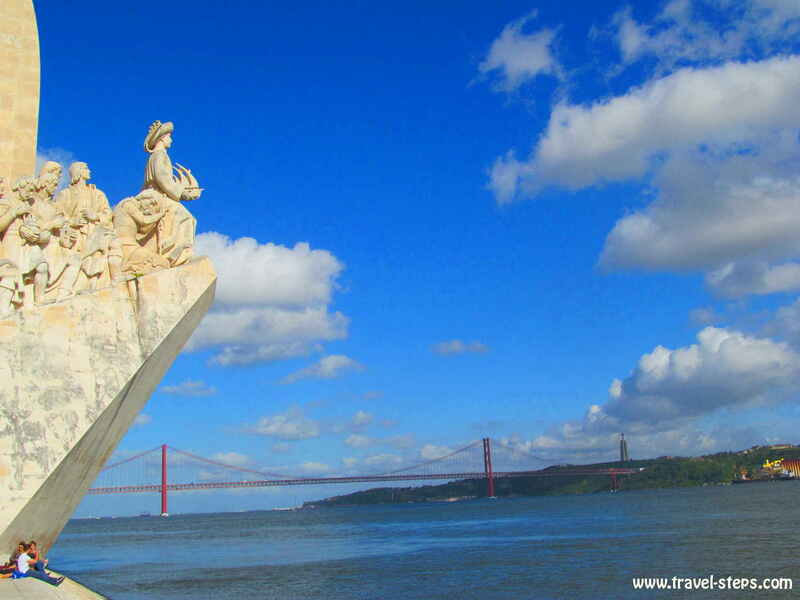 The river Tejo in Lisbon can be explored by public ferry. It’s one of the sightseeing things to do while backpacking Portugal. In Lisbon, there are three ferry terminals, from where you can start a trip around the river Tejo. The ferry terminals Terreiro do Paço and Cais do Sodré are close to the city center. Another ferry terminal is located in Belém. All ferries go to different terminals at the southern shore of Lisbon. Prices vary between 1,25 and 2,75 Euros for a single trip. The cheapest and shortest ride for 1,25 Euros and 20 minutes for a single trip is the ferry from Cais do Sodré to Cacilhas. Check out ferry timetables here. The great thing about Lisbon is, that the ocean is always close. 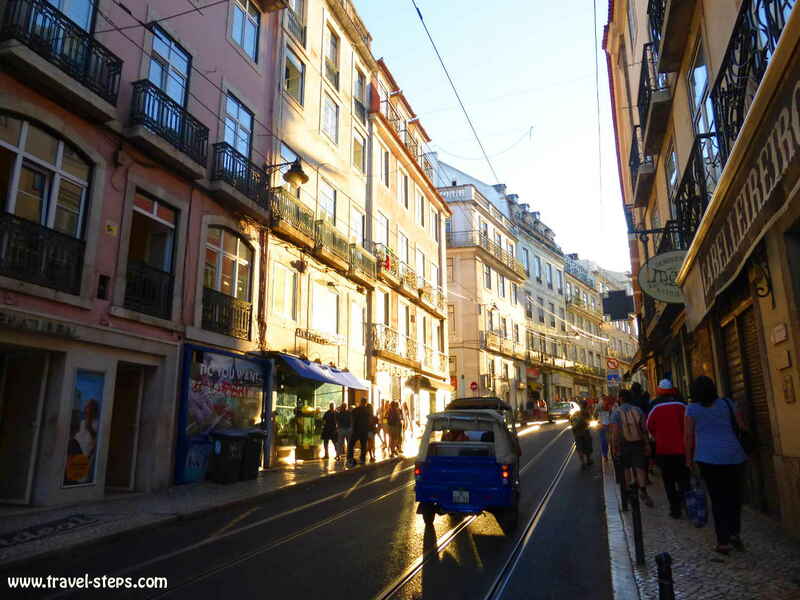 It just takes 15 to 45 minutes by local train from Cais do Sodré to get to different beaches. 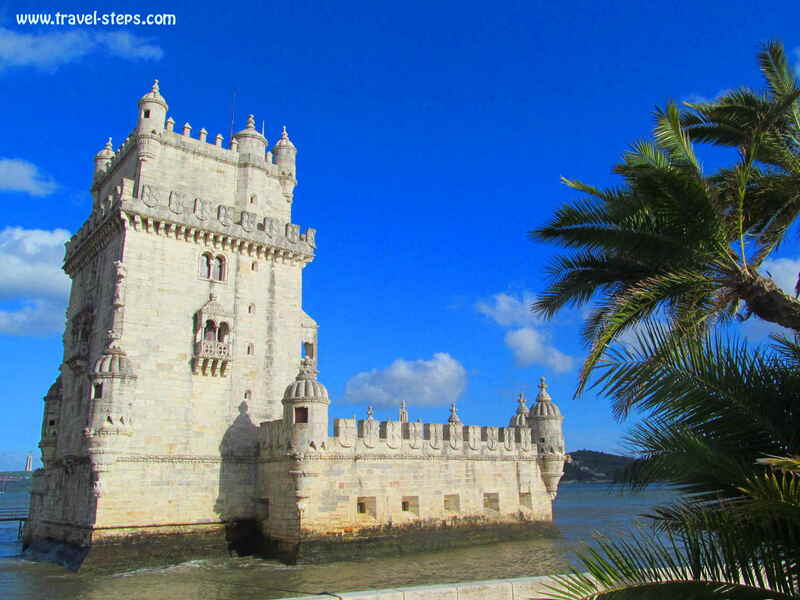 It’s a beautiful scenic ride right at the ocean, passing also the Torre de Belém and the Monument Das Padrão dos Descobrimento. The most popular, touristy and lively beach resort town close to Lisbon is Caiscais. You can hop off the train at every stop to get to a beach. Not all are equally beauty. Almost all the beaches have a city character and are packed with people in summer. The train tracks and the street are always close. The closer you come to Lisbon, the more urban the beaches look. Don’t expect a natural feeling of liberty. You have to get out of Lisbon to feel the power of the ocean, the nature and maybe even a bit of loneliness and exclusiveness. 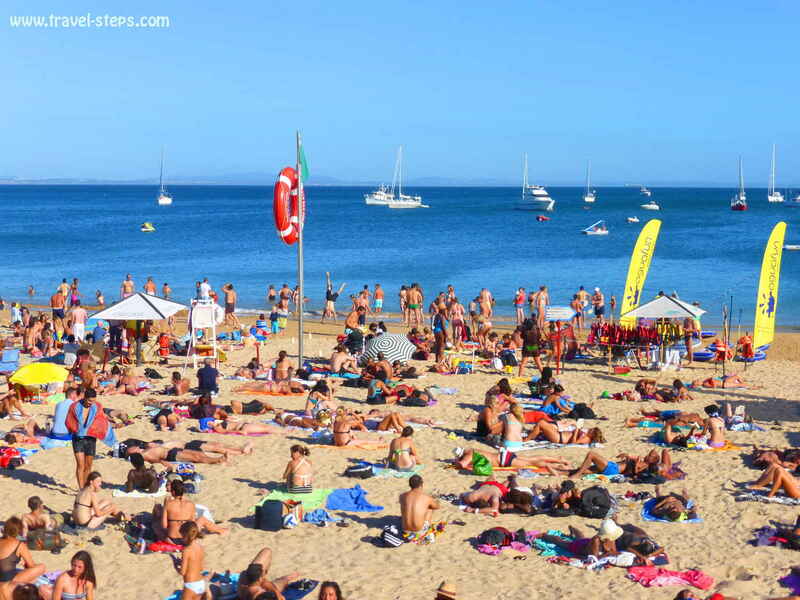 But the city beaches of Lisbon offer a great opportunity to jump into the water on hot days while backpacking Portugal. We already enjoyed the train ride right next to the ocean. The only downside: Getting to the beaches of Lisbon by train in summer can be nerve-wracking. The queues in front of the ticket machines at Cais do Sodré in Lisbon can be long and slow on weekends. It’s impossible to board the train at that station without a ticket. When we saw the horrible reality on a Sunday, we decided to walk to the next train stop to the direction of Caiscais. But there were still far too long queues at the only ticket machine. But the good thing at most of the train stops after Cais do Sodré is: You can enter the platform without any ticket and can leave the platform at each station without a ticket. But watch out for ticket inspectors! Cascais is one of the more exclusive places at the ocean close to Lisbon. The tourist overkill made it become a conglomeration of restaurants and bars with lots of waiters swarming out to catch some tourists. We felt, that it all was a bit too much. In August, the town is packed with people. But to our surprise, there were still some restaurants and fast food places with affordable prices for travelers backpacking Portugal. But when we asked for the price of a private room in a hostel, we decided to stay in our multicultural part of Lisbon close to the Metro station Intendente. A double room in a hostel was around 70 Euros in Caiscais. The sandy white beach is nice but in August far too small for the big number of beach lovers, holiday makers, locals from Lisbon and water sports fans. Finding a spot in the sand without touching the toes of your neighbors is a little challenge. Same as swimming in the cold ocean. 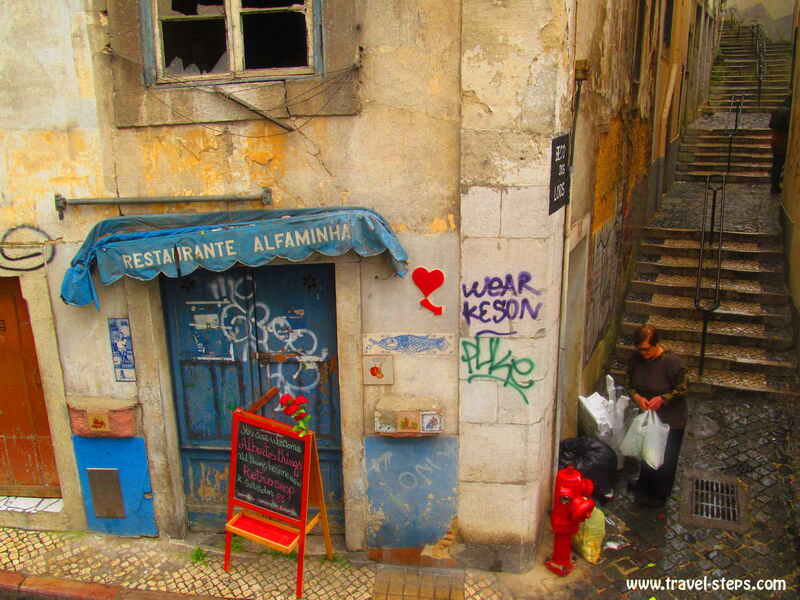 We really loved the local eateries around Intendente subway station in Lisbon. Just walk up and down Av. Almirante Reis to find them. There were a lot of Indian and Nepalese restaurants set around the main street, but also burger places, kebab shops and pastelarias. 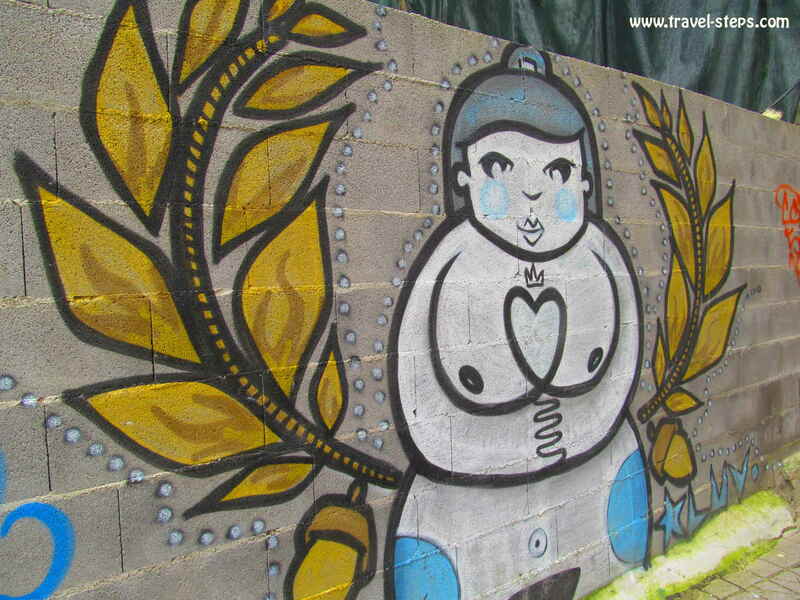 It is one of the best areas in town for hungry backpackers on a budget in Lisbon. 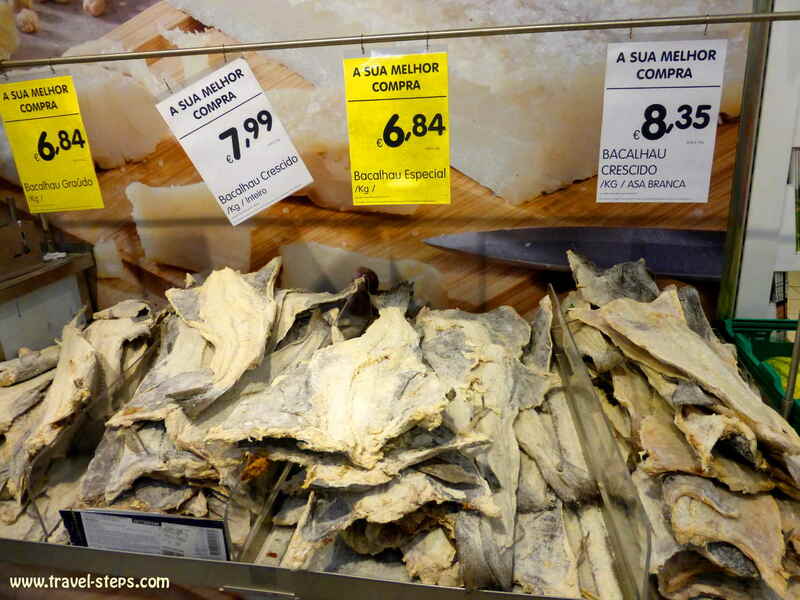 Try Bacalhau while backpacking Portugal! We had the most delicious Bacalhau dish in one of the small local restaurants, where locals were already queuing on the street for takeaway. For example, we had a plate of fish, potatoes and veggies for 7 Euros. A bottle of wine for 5 Euros. The soup of the day for 1,10 Euros. It was really cheap and really good. We loved the atmosphere eating between Indians, Africans, Portuguese, South Americans and Chinese people while backpacking Portugal. In general, backpackers can find cheap choices for lunch and dinner places in the more traditional and old-fashioned looking eateries in Lisbon. Eating out in Lisbon does not necessarily has to be expensive – depending on the quarter of the city. But the quality in food and service differs a lot. We had the worst experience in a Portuguese restaurant run by Indians between Rossio and Martim Moniz. We had to wait around 50 minutes for our food. Well, for the soup of the day. The waiter forgot, that we had ordered it. We had to tell him again. After one hour, we were still waiting for the main course. We wanted to move from the terrace to an inside table of the restaurant. It had been gotten colder outside. The waiter was just rolling his eyes in a very unfriendly way whispering curses. We told him politely, that his behavior was quite unprofessional. The fish finally was very salty, the fries cold, the veggies almost non-existent. The waiter wasn’t talking to us anymore at all. And our mood was really bad by then. Tourist Information in Lisbon: Useless! The advise, that we got from tourist information offices in Lisbon, was pretty useless. As long as you are not just interested in the entrance prices for museums or directions, it can be more helpful to read a travel guide-book. When we arrived in Lisbon and asked for a cheap place to stay close to a relaxed beach, the lady at the tourist information desk at the airport sent us to Oeiras. When we got of the train in Oeiras, we realized immediately, that this had been a bad joke. It was a residential area. No backpacker places around. Nothing around except from houses and a local beach in the distance. We were looking lost. A black guy smoking a joint and leaning against a kiosk wall came over to us. He wanted to help and suggested taking a taxi to some far away hotels. Getting a taxi was not, what we wanted while backpacking Portugal on a budget. Moreover, the staff at the tourist information at the airport didn’t give any information about public buses going to the city center, but was promoting the more expensive Aerobus shuttle. The city’s top attractions can be pricy, but most also have one morning a week when it’s free to enter. On the first Sunday of each month, you can catch the big sights for nothing, including the Museu Nacional do Azulejo tile museum, the Museu Nacional de Arte Antiga, the Mosteiro dos Jerónimos in Belém, the Torre de Belém and the unmissable art collection of the Museu Gulbenkian. Just a 45-minute-train-ride away from Lisbon’s train station Rossio, Sintra is hidden in green scenery. Sintra’s castles attract and impress hordes of tourists. For a reason: It could be the home of Cinderella and Snow White and is absolutely worth a visit while backpacking Portugal. 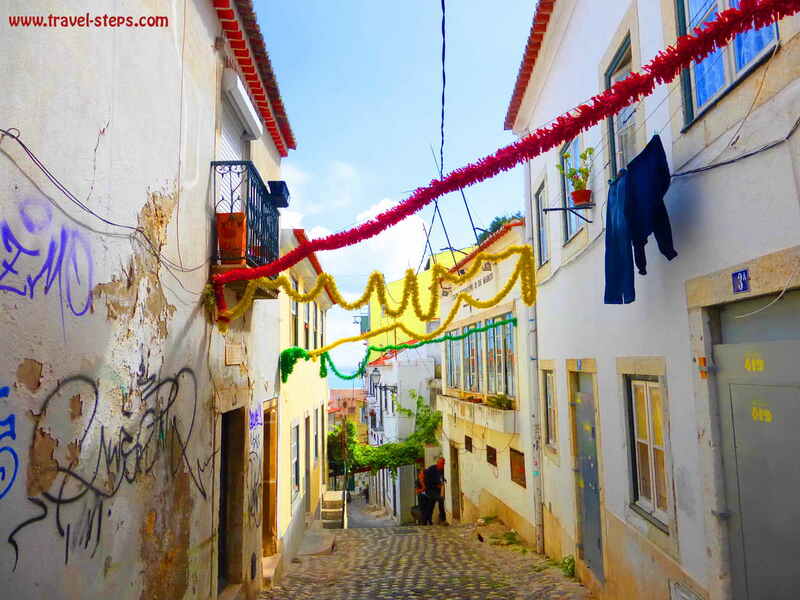 It is very interesting to see how many tourists can squeeze into the small lanes of Sintra in summer. In August, you have to take care not to get rolled over by a tour bus from Poland or Germany. Still, you feel the mystery of the town full of castles set in the beautiful scenery of Serra de Sintra National Park. But better go to Sintra in spring or autumn, if you want to avoid the crowds. 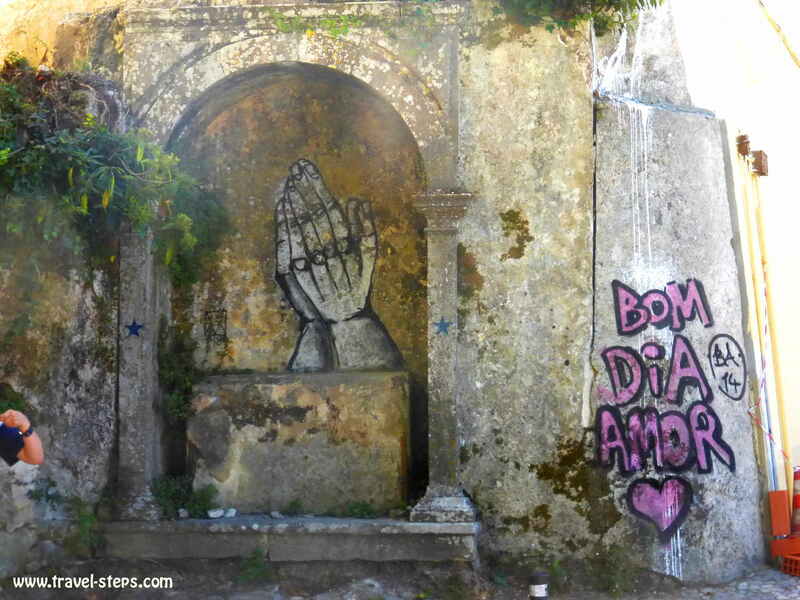 If you go in the low season to Sintra while backpacking Portugal, you will find a charming little artist town making you smile and relax. Sintra: Visit Palacio da Pena or The Quinta da Regaleira? The Palacio da Pena clearly is Sintra’s main attraction. 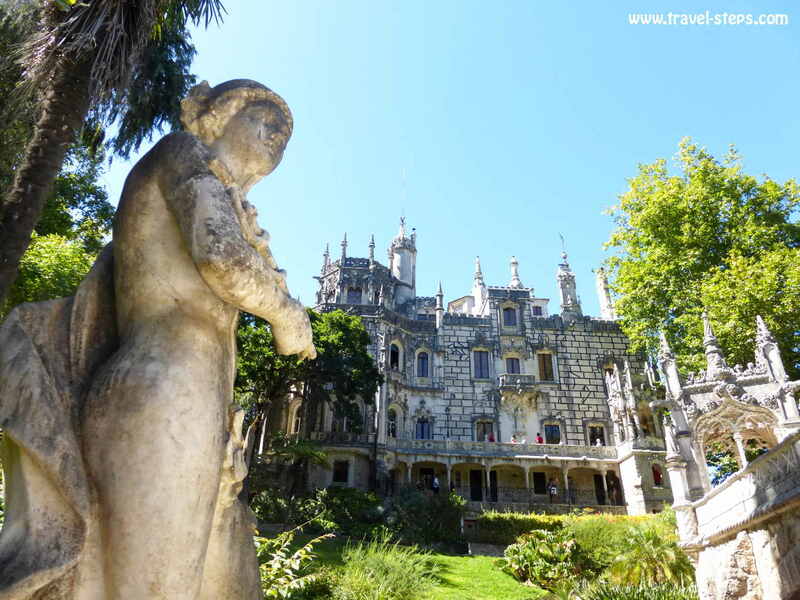 Whoever doesn’t feel like queuing for the bus up to or the entrance ticket for the colorful Palacio da Pena up in the mountains can also visit “The Quinta da Regaleira”. It is a 19th century extravagant gothic mansion that was constructed by the once richest man of Portugal. I felt like being set back in time while walking through the mystic gardens full of caves, tunnels, lakes and secret spots. There are more architectural treasures to discover. And in the distance, you see the ocean behind green hills.It’s absolutely worth a visit. 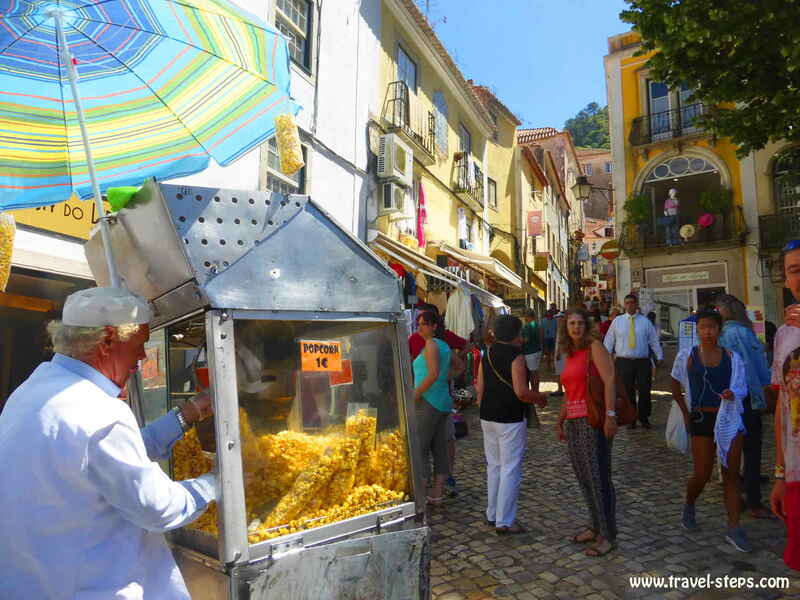 In Sintra, the tourist information in the town center is very helpful with advise. Forget about organized tours, if you want to save some money discovering the surroundings of Lisbon while backpacking Portugal. With a day ticket for suburban trains, you can develop your own hop-on-hop-off- tour from Lisbon around Sintra, Cabo da Roca and the beaches between Lisbon and Cascais by public transport for 15,50 Euros per person. The ticket is a day ticket and valid for 24 hours – but just within one day from midnight to midnight. 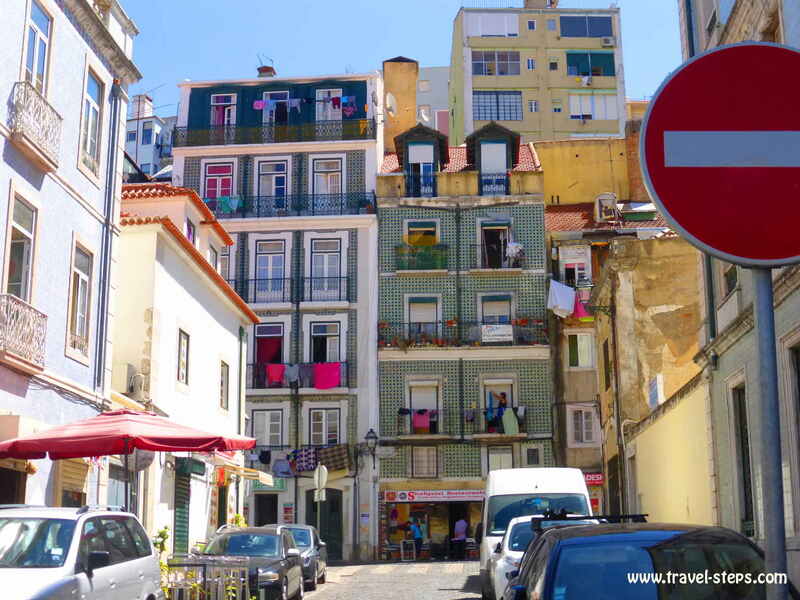 The train to Sintra starts hourly every full hour from Rossio train station in Lisbon. There, you get the day ticket at the counter. Just make exactly sure at the counter, which places you want to visit. Otherwise, your ticket might not be valid for the whole trip including the bus. The train to Sintra takes around 45 minutes and stops in Sintra 15 walking minutes away from the town center. After a sightseeing trip around Sintra, you can take bus 403 to Cabo da Roca from the train station in Sintra. Stop at Cabo da Roca as long as you want. And hop back on the bus afterwards. The same bus line goes on to Cascais. In Cascais, you can take the train back to Lisbon Cais do Sodré stopping at all city beaches. The trip works in both directions. You can also buy your train ticket at Cais do Sodré, go to Caiscais first and on to Cabo da Roca and Sintra. It can be a good trip, if you don’t have much time backpacking Portugal. After our sightseeing tour in Sintra, we went on with bus 403 to Cabo da Roca. 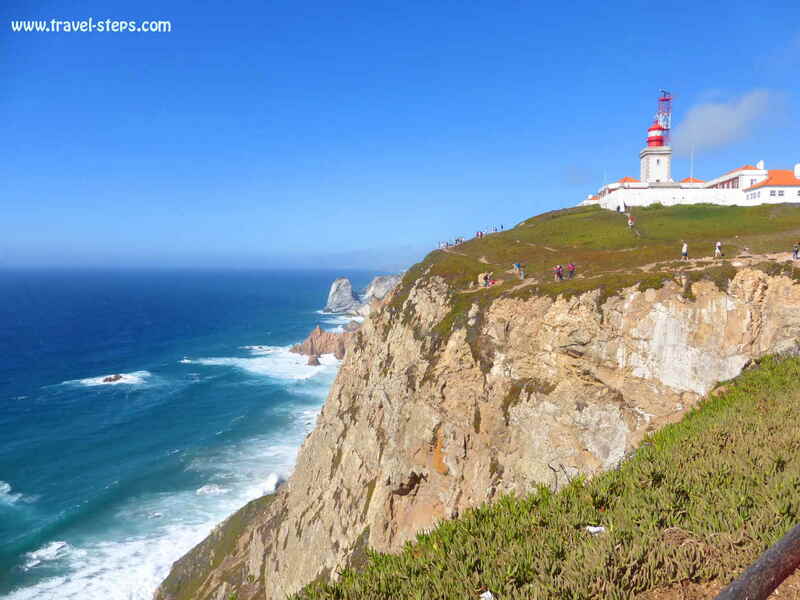 The bus goes every half hour to Cascais stopping at the westernmost point of continental Europe Cabo da Roca. Don’t be too shy to get into the bus. We had to stand for the whole half hour trip trough small curvy lanes, because there were no seats left for us. It was extremely windy, when we arrived at Cabo da Roca. The view is stunning. You just have to share it with a few hundred tourists taking selfies. For those, who are more adventurous while backpacking Portugal: There is a hiking trail to another more hidden viewpoint at Cabo da Roca. You can start walking down to a secret beach just about 100 metres away from the bus stop on the side of the lighthouse. But the trail is steep. Don’t forget, that you have to climb up again. Most tourists probably just queue for the bus back to Sintra or on to Cascais. Keep your metro, train, tram, ferry and bus tickets! Or pay 50 Cents for every new one! When you charge your metro, train, ferry or bus card in Lisbon for the first time, it is necessary to buy the card. The card costs 0.50 Euros and is valid for one year. During this period, the card can be charged and reused as and when necessary. Get information about metro/bus/tram fares and day tickets here. Get information about train times and prices here. 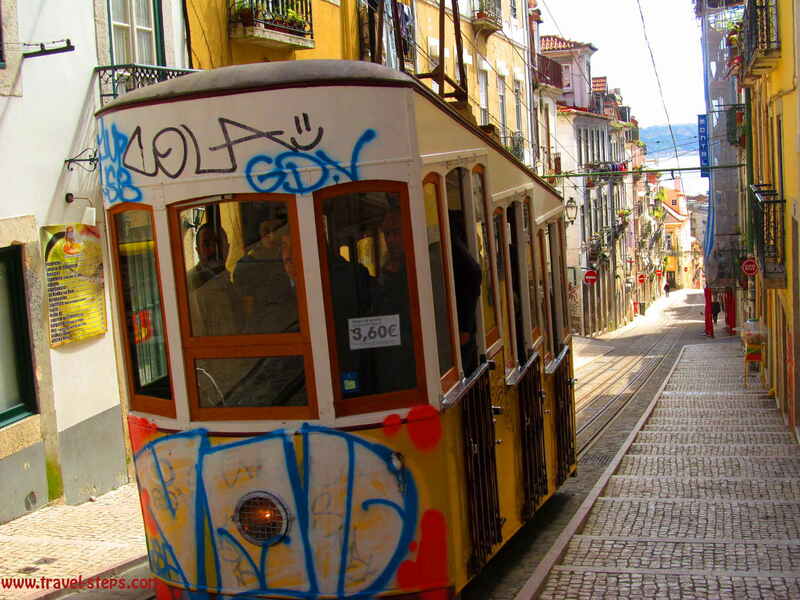 Read more about buses and trams, fares and routes in Lisbon. 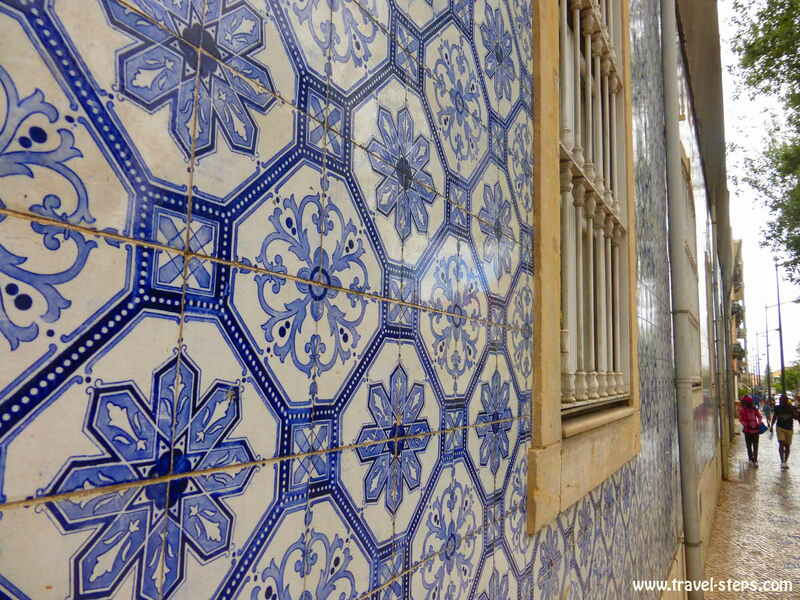 Read more about Lisbon Metro. If you want to use all kinds of public transport in Lisbon, trains, trams, buses, ferrys and metro, make sure to get a rechargeable card, that works for all of them. We didn’t know anything about the public transport system in Lisbon and ended up buying separate cards for each way of transport and almost each trip. Each time, we had to pay 50 Cents extra. And each time, we were pretty frustrated, because we didn’t understand, why our train card didn’t work for the metro and the other way round. 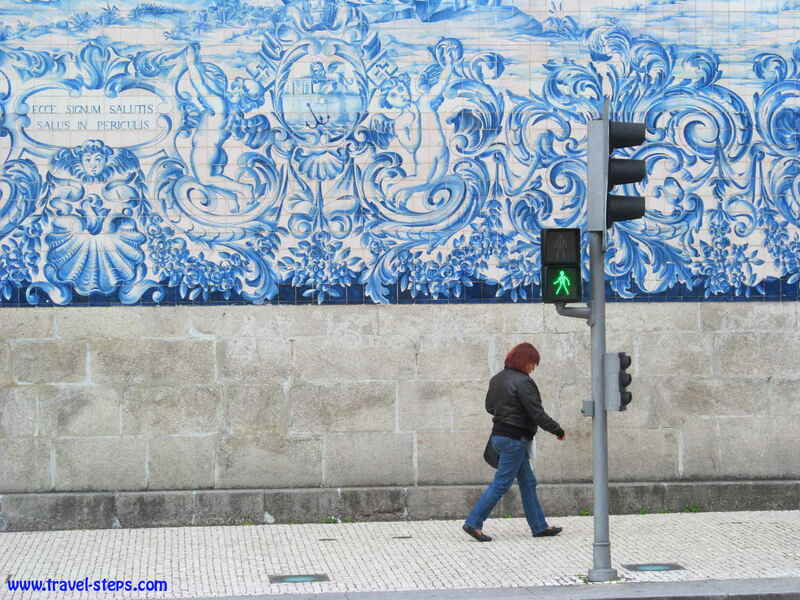 Apart from Lisbon, also Porto is a perfect spot for a weekend trip or a stopover while backpacking Portugal. To be honest: I had expected sunny Portuguese weather, when I went to Porto in spring. What I got instead was drizzle, fog and gray sky for a few days. 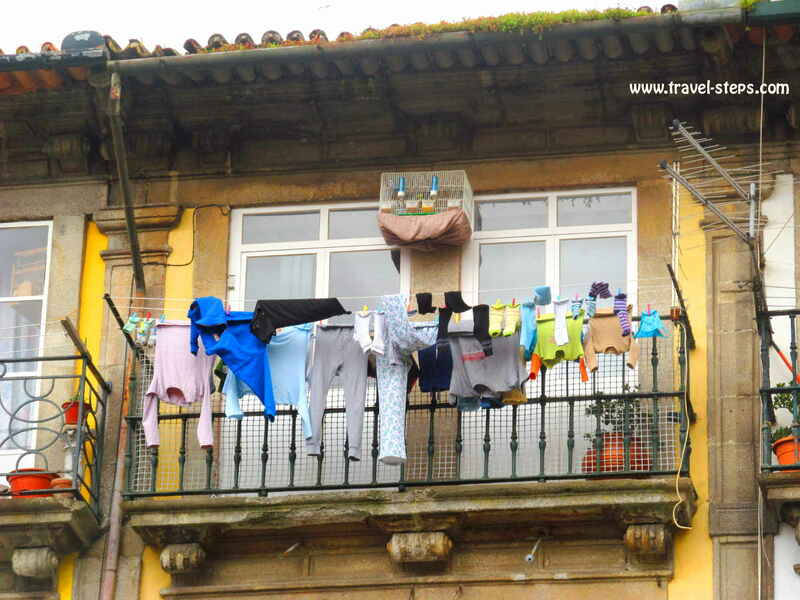 Just don’t expect warm temperatures in Porto all year round. But in spite of that or maybe even because of that, Porto offers a perfect scenery for photographers backpacking Portugal. 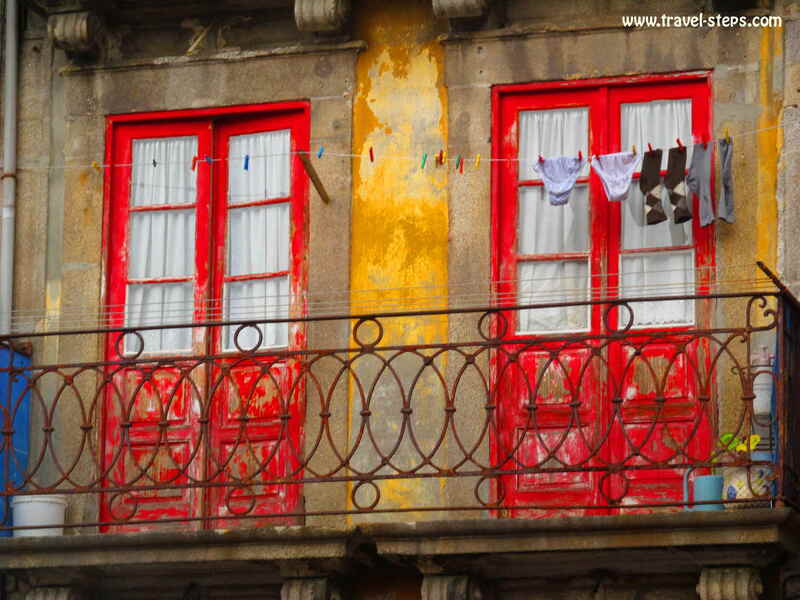 My camera just loved Porto while backpacking Portugal, the mystic light, the run down facades, the colorful balconies with full cloth lines. The good thing about the bad weather in April: There were hardly any tourists around in Porto.While backpacking Portugal in spring, I had the full town almost to myself. That was how it felt. The a free walking tour was surprisingly good. 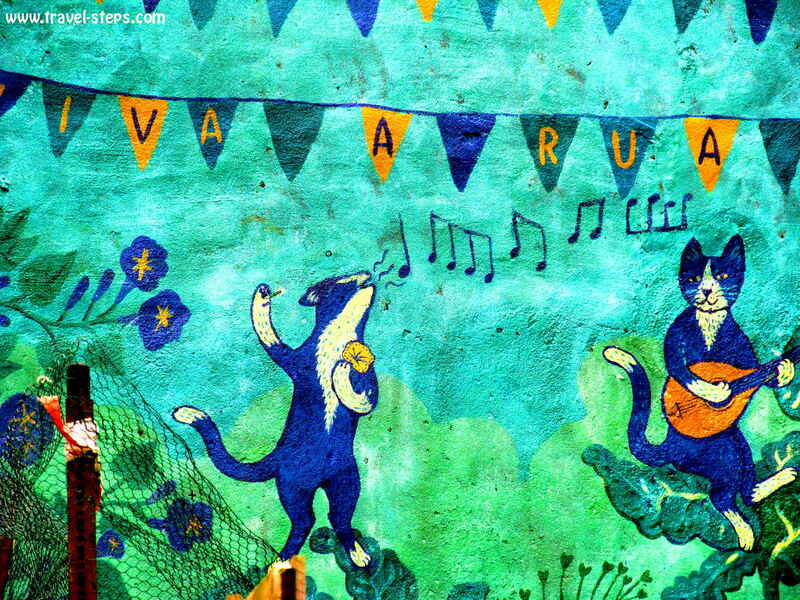 There are two different free walking tours in English starting everyday at Praça da Liberdade at 10.45 am and 3.30 pm. Porto Walkers Free Walking Tours are held by a group of freelance locals who are passionate about introducing you to Porto. One of the most fun things to do in Porto while backpacking Portugal is to visit Porto’s magical bookshop Livraria Lello. This book store is said to have been J.K. Rowling’s inspiration for her own Flourish and Blotts bookstore in the Harry Potter series. Livraria Lello had been chosen for the world launch of the eighth and very different book about the young magician, “Harry Potter and the Cursed Child on July 31st in 2016. I loved walking around the bookstore and touching the wooden furniture. It’s not allowed to takes pictures, but it is hard to resist. But the most fun thing to do in Porto while backpacking Portugal clearly is to take part in a port wine tasting. There are tours offered everywhere. Some are even for free. In April 2011, the cable car “Teleférico de Gaia” started running between antique Dom Luis I Bridge and Porto Wine Cellars. It is open every day all year round except Christmas day. The one way trip for an adult starts at 5 Euros for a five-minute-trip over 600 meters. If you like vitamins, try something else! 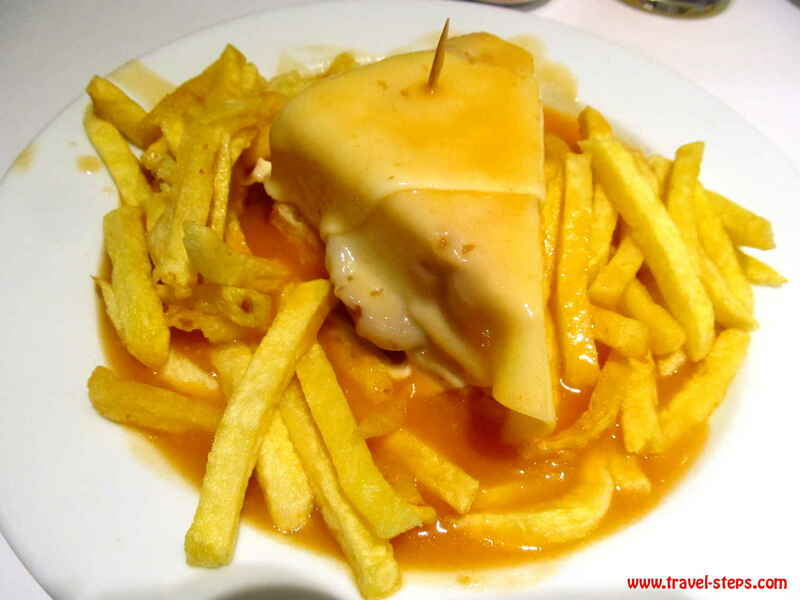 In the low tourist season, the waiters in the restaurants in Porto had enough time to introduce the Francesinha to me, a typical dish of Porto. It is a Portuguese sandwich originally from Porto, made with bread, wet-cured ham, linguica, fresh sausage like chipolta, steak or roast meat and covered with melted cheese and a hot thick tomato and beer sauce served with french fries. 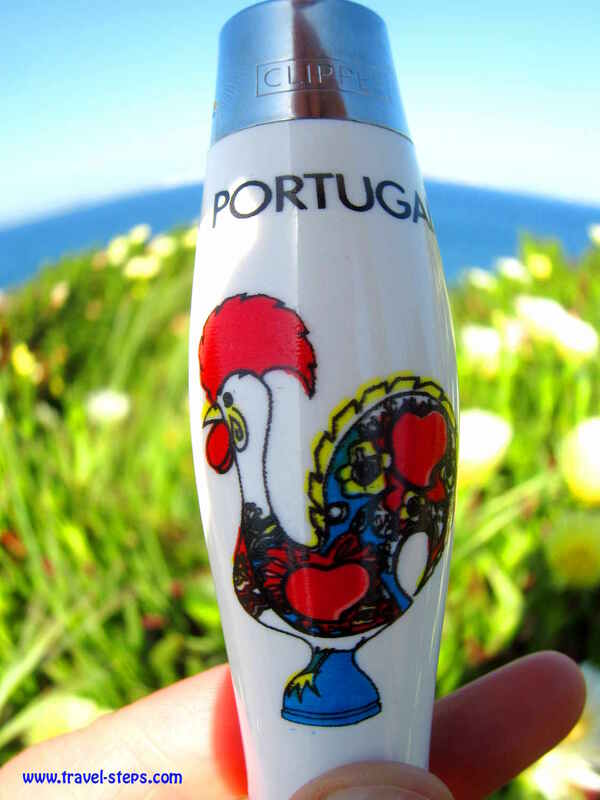 If you are looking for vitamins while backpacking Portugal, try something else! I didn’t want to be a buzz kill and had some of that pretty much unhealthy dish together with some other travelers from my hostel. But I prefer the Port wine as one of Porto’s other specialties a lot more. Whenever we talked to young Portuguese people about the Algarve coast while backpacking Portugal, they all gave the same answer. “The tourism industry messed it up”. 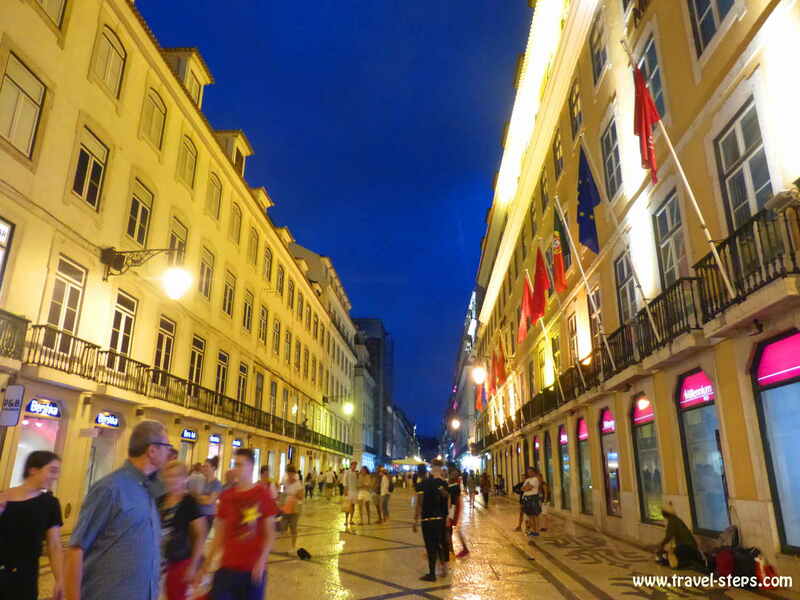 Locals from Portugal are complaining about too much concrete, a tourist overkill, cheesy bars. No one wanted to recommend to spent time there in the most popular holiday time of the year. 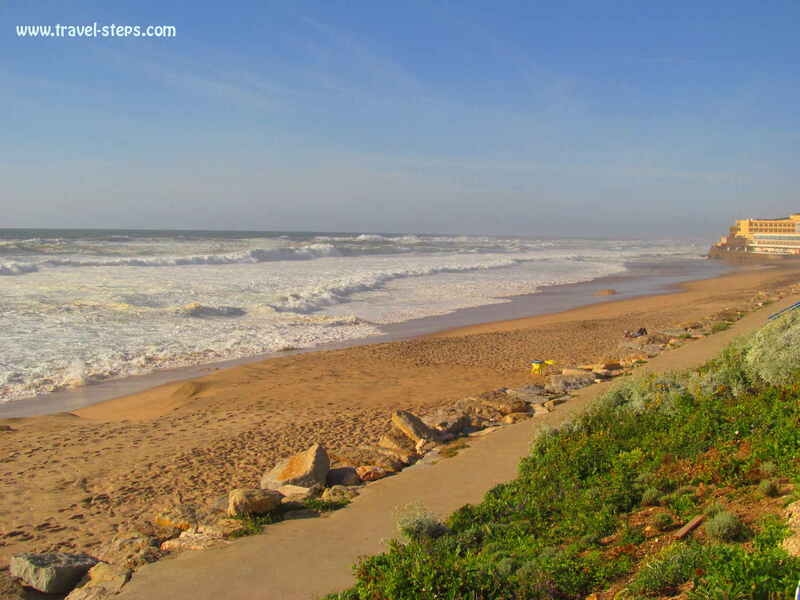 We got advised to go anywhere else in Portugal in summer than to the Algarve coast really to enjoy the ocean. And we followed that advise. As they said, there are more hidden and local places to discover in Alentejo between Lisbon and the Algarve coast. Wide white beaches. Space for camping stopovers and a good time in the right mindset. Just dare to leave the Portuguese tourist paths, that had been promoted in international travel magazines for ages. 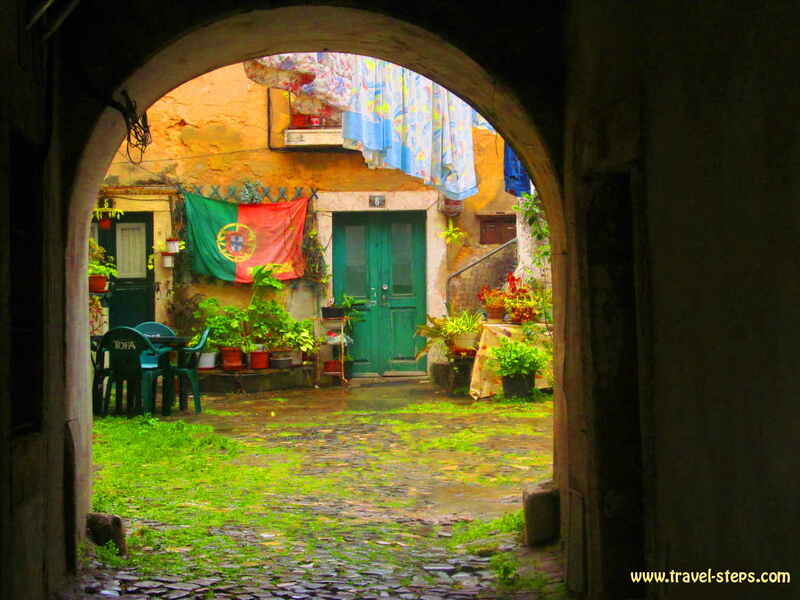 Discover new places while backpacking Portugal and better keep the spots secret! When I was at the Algarve coast in April 2013, I was walking trough almost empty lanes in Lagos and visited the natural monuments on long walks. I was one of just two guests in my hostel with a lovely roof terrace. While backpacking Portugal, I stayed in Lagos in Cloud 9 Hostel. The bed in my hostel in Lagos was just 10 Euros per night. It makes sense to check webpages like www.hostelbookers.com or www.budgetplaces.com before checking in to an accommodation as many hostels and hotels offer amazing deals with price reductions in winter, spring and autumn. In Lagos, I felt really relaxed and enjoyed my time there very much. 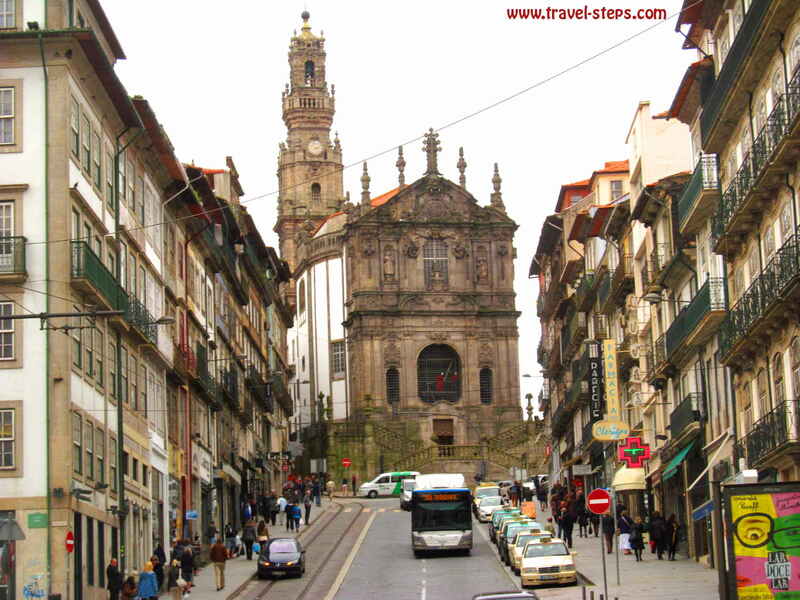 Lagos is easily reachable by bus from Lisbon, from Porto even overnight. The landscape at the Algarve coast was seriously stunning, the colors amazing. The water was just warm enough to dare a short dip into the waves. I loved the Algarve coast. But I didn’t want to ruin my memories. So whenever I go back there, it won’t be in the main tourist season. I can just imagine, how crowded the Algave Coast must be in summer. It’s beautiful enough to get crowded. And there are some more people backpacking Portugal.